Map is showing Ukraine situated in eastern Europe, north of the Black Sea and the Sea of Azov, a country at the crossroads between Europe and Asia. Ukraine's fertile land was known as the breadbasket of the Soviet Union, now it became the breadbasket of Europe. With an area of 600,000 km² it is the second largest country in Europe after European Russia, twice the size of Italy or slightly smaller than the U.S. state of Texas. Ukraine is bordered by Belarus, Hungary, Moldova, Poland, Romania, Russia, and Slovakia. Topographically, Ukraine consists mainly of plains and plateaus, but the Carpathian mountains in the west reach 2,061 m (6,760 ft.) at Mount Hoverla (Hora Hoverla), which is the highest mountain in Ukraine. Ukraine's major rivers are: Dniester, The Western and the Southern Bug (Pivdennyi Buh), Desna, Seversky Donets and the Dnieper (Dnipro) an important waterway and the longest river in Ukraine with its large water reservoirs the Kremenchuk Reservoir and the Kakhovka Reservoir. Ukraine has a population of 42.4 million people (in 2017), capital and largest city is Kiev with a population of 2,8 million, the city is a major industrial, scientific, educational, and cultural center in Eastern Europe. Spoken languages are Ukrainian (official), Russian is widely spoken, especially in eastern and southern parts of the country. 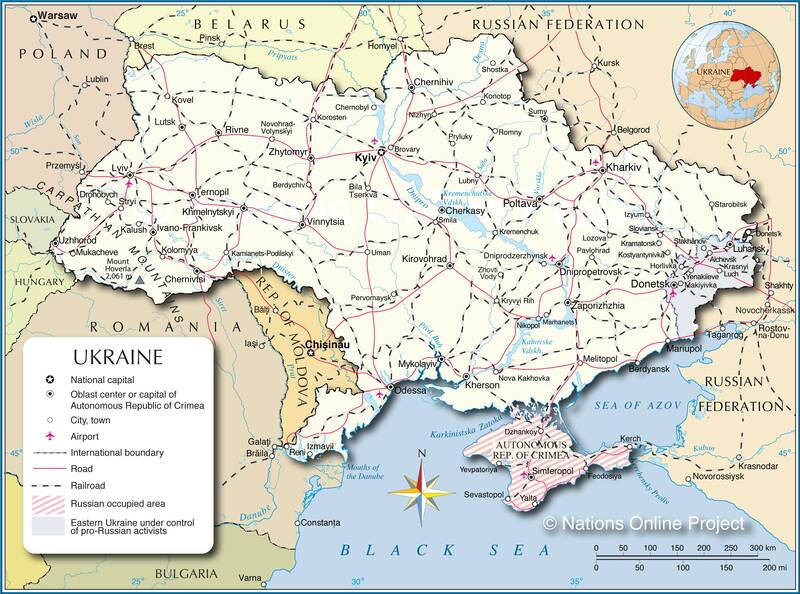 Depicted on the map are Ukraine with surrounding countries, international borders, main rivers, major cities, main roads, railroads, and major airports, as well as the Russian occupied Crimean peninsula and the region in eastern Ukraine under the control of pro-Russian activists. You are free to use this map for educational, or informational purposes (fair use), please refer to Nations Online Project. Largest cities (with a population of over 1 million): Kyiv (Kiev), Kharkiv (Kharkov), Dnipropetrovsk, Odesa (Odessa), and Donetsk (not to be confused with the Russian town of Donets'k at the Ukrainian border near Luhansk). Other Cities and towns: Alchevsk, Berdyansk, Berdychiv, Bila Tserkva, Brovary, Cherkasy, Chernihiv, Chernivtsi, Chornobyl (Chernobyl), Dniprodzerzhynsk, Drohobych, Dzhankoy, Feodosiya, HorlivkaIzmayil, Ivano-Frankivsk, Kalush, Kerch, Kherson, Khmelnytskyi, Kirovohrad, Kolomyya, Konotop, Korosten, Kostyantynivka, Kovel, Kramatorsk, Krasnyi Luch, Kremenchuk, Kryvyi Rih, LozovaIzyum, Lubny, Luhansk, Lutsk, Lviv, Makiyivka, Marhanets, Mariupol, Melitopol, Mukacheve, Mykolayiv, Nikopol, Nizhyn, Nova Kakhovka, Novohrad-Kamianets-Podilskyi, Pavlohrad, Pervomaysk, Poltava, Pryluky, Reni, Rivne, Romny, Sevastopol , Shostka, Simferopol, Sloviansk, Smila, Stakhanov, Starobilsk, Stryi, Sumy, Ternopil, Uman, Uzhhorod, Vinnytsia, Volynskyi, Yalta, Yenakiieve, Yevpatoriya, Zaporizhzhia, Zhovti Vody, Zhytomyr.